Parents giver their children too much and expect too little. Material indulgence – everything from excessive toys to cellphones, cars and credit cards – is just the beginning. 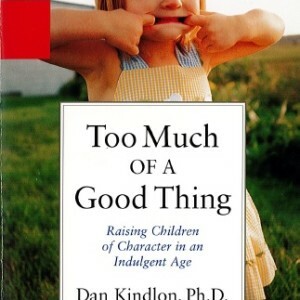 With good intentions parents too often emotionally indulge their children as well. There is too much negotiation, overprotection, an overall sense of entitlement, and too few of the character building experiences that lead to happiness and psychological health. Too Much of a Good Thing outlines the consequences of a generation of children surrounded by a sea of choices, and a lack of limits and barriers. 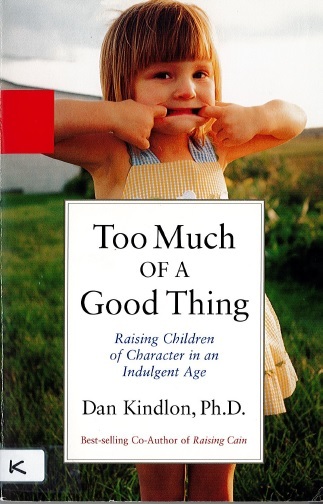 After a nationwide survey of suburban teenagers, Dr. Kindlon discovers alarmingly high levels of depression, anxiety, body image problems, and weak character, much of it invisible to their parents. This book offers profound wisdom about how parents can reach out to their children, teach them engagement in rewarding activity, and promote emotional maturity and a sense of self-worth.